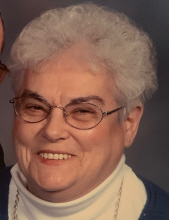 Virginia M. Carico, age 84 of Chrisman, IL went home to be with the Lord on Wednesday, December 5, 2018 at Harrison Crossing in Terre Haute, IN. Virginia M. Walters was born September 14, 1934 in French Lick, IN to the late Joseph and Golda (Crews) Walters. She was the oldest daughter of eight children. Virginia married Dale Carico on December 2, 1951 at the home of Dale’s parents, Crockett and Nora Carico by Rev. Frank Nestler in Chrisman, IL. Dale preceded her in death on February 26, 2016. Virginia is survived by her children: Bob Carico, Janet Kindred (Dale Winans) and Jean (Tom) Scott, all of Chrisman, IL; four granddaughters: Michelle (Troy) Lunger of Chrisman, IL, Theresa (Troy) Latoz of Georgetown, IL, Stacey (Todd) Gosnell of Paris, IL, and Misty Terry of Turlock, CA; nine great-grandchildren; a brother: Paul Walters of Staughton, IN; a sister: Shirley (Jaime) Estavillo of Carbondale, IL; three sisters-in-law: Vange Walters of Ladoga, IN, Vera Carico of Crest Hill, IL and Pat Carico of Sarasota, FL; and many nieces, nephews and cousins. Virginia was a member of the First United Methodist Church of Chrisman. She enjoyed bowling and was the league and city secretary for many years. She coached girls softball teams and was a member of the Athletic Booster Club, Eastern Star and Homemakers Extension. Virginia was a stay at home mom, a cook at the Chrisman School District, and then a salesperson at Mooney Ford in Chrisman before retiring. Funeral services will be held on Saturday, December 8, 2018 at 1:00 p.m. Krabel Funeral Home in Chrisman, IL with Rev. Don Shane officiating. Visitation will be held for two hours prior to the service, beginning at 11:00 a.m. Burial will follow at Woodland Cemetery. For those who wish, memorials may be made to the United Methodist Church of Chrisman or the Multiple Sclerosis Association. To send flowers or a remembrance gift to the family of Virginia Carico, please visit our Tribute Store. "Email Address" would like to share the life celebration of Virginia Carico. Click on the "link" to go to share a favorite memory or leave a condolence message for the family.